Keeping merchandise for sale in place and well organized on gondola shelving can be a challenge, especially when you have various sized product packages and bottles to display. Fortunately, for grocery stores, drug stores, dollar stores, pet stores and all other retail environments that use metal gondola shelves, there are many gondola accessories available that offer great solutions for shelf management. At Discount Shelving and Displays we are pleased to offer a unique shelf management system that fits any brand of gondola shelving. Our EZ Clear Universal Shelf Divider System are easy to install and fit into any hole in the gondola shelf, whether your shelves have circular, diamond or square holes. Our unique pin configuration is designed to fit all gondola shelves in the marketplace today including Madix, Lozier, Handy and Streater. Made of durable plastic, you can easily break off the back EZ Clear Divider in 2″ increments to adjust to the correct depth of your shelves. We offer these dividers in 2 size options: 16 inches deep and 5/8 inches high, or 24 inches deep and 15/16 inches high. Use our EZ Clear Universal Shelf Divider System to keep your products aligned and maximize gondola shelf space for optimal merchandising. 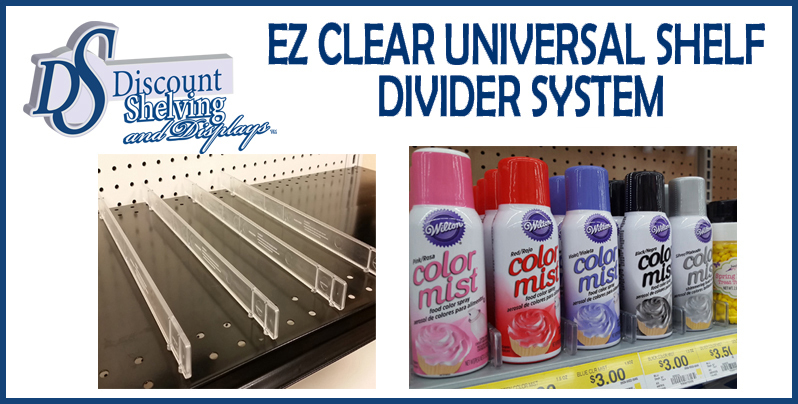 For more information on our EZ Clear Universal Gondola Shelf Dividers visit: www.discountshelving.com. 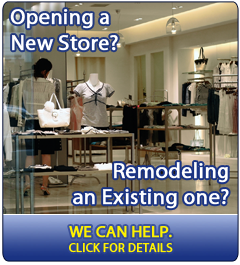 Be sure to sign up below to receive savings coupons, new arrivals updates, useful tips and catalogs from Discount Shelving & Displays.